Diwali, the Indian "festival of lights", is celebrated in Autumn. It is based on the Lunar calendar and this year falls on the 23rd of October . While the rituals vary across different parts of India, it is celebrated everywhere with lights and lanterns, fireworks and sweets. Here in the UK, I have been to the Diwali celebrations held at the Trafalgar Square in London. Leicester is known to host some of the biggest Diwali celebrations outside India. Since Diwali is a major festival a variety of sweets are prepared at home. An essential in any Hindu festival is the 'Kheer'; typically made with rice. You can call it the Indian Rice Pudding :) and the desert can be prepared with very few ingredients which are usually available in every home. Recently I was sent a packet of Amira Basmati Rice and I decided to prepare some 'Rice Kheer'. Before I move on to the recipe, here is some information about the brand. Amira was founded 99 years ago but launched in the UK only last year. Amira provides high quality, delicious aromatic rice and is the only rice used in Michelin-starred restaurant Trishna and 2014's No.1 restaurant Gymkhanna. 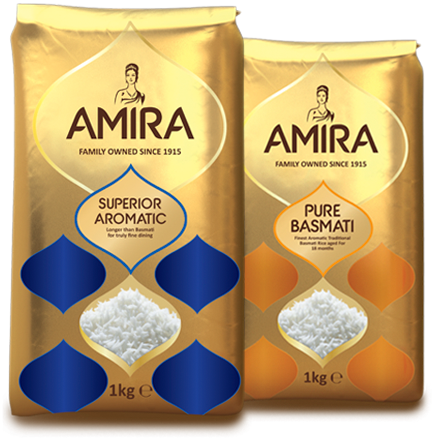 You can pick up Amira Rice from Morrison's and Tesco. Method: Mix together the rice, milk and condensed milk in a pan. Cook on a low flame for around 10 minutes stirring continuously. Add the ghee and cardamom powder and mix well. Garnish with dry fruits and serve hot. Can also be served chilled. This is quick recipe that I follow as it saves a lot of time. Traditionally it takes a little longer though as milk and uncooked rice are simmered for a long time till the rice is cooked. This imparts a lovely colour and flavour to the kheer. Having said that, the quicker recipe that I follow also makes an equally delicious desert. Do give it a try as it is an absolutely delectable treat. It can be served either warm or chilled like I mentioned earlier and tastes equally delicious in both cases.